NOTE: Natural Pink Lemurians were discovered in one pocket of the same mine in Minas Gerais, Brazil where the Lemurian Star Seed crystals were originally found. The pale pink coloring is due to a dusting of Hematite during the growth process. This coloring is within the layers of crystal growth. The "New" Pink Lemurians that are currently available also have a pink to orange pink coating of oxidized Hematite. However, these are more similar to Tangerine Quartz. The Hematite on these can easily be removed and/or may chip or flake off. Check for the alternating pattern of horizontal striations and smooth sides. If they are present, you have a Lemurian Star Seed. If the sides are smooth all the way around, what you have is Tangerine Quartz. 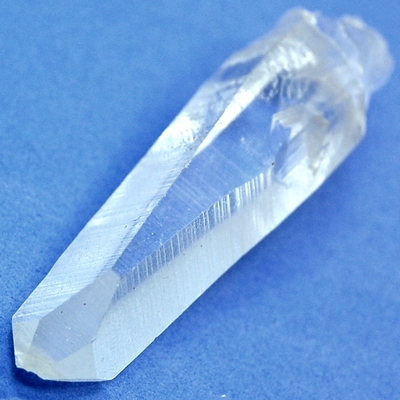 Click here to see Lemurian Quartz in our online catalog. Affirmation: I am connected to a divine source of information. Question: Do you think ancient civilizations were more advanced than we are now?